Shlomit Weksler-Bdolah, excavator of the Israel Antiquities Authority (IAA), holds a stamped piece of clay from the First Jewish Temple period which belonged to the "governor of the city" of Jerusalem, the most prominent local position to be held in Jerusalem of 2700 years ago, and which were excavated at the northwestern part of the Western Wall plaza in Jerusalem's Old City, on January 1, 2018, at he IAA laboratories in Jerusalem. The extraordinary find is a lump of clay, stamped and pre-fired, measures 13 x 15 mm and is 23 mm thick. The upper part of the sealing depicts two figures facing each other, and the lower part holds an inscription in ancient Hebrew script. GALI TIBBON / AFP. JERUSALEM (AFP).- Israeli archaeologists unveiled on Monday a 2,700-year-old clay seal imprinted with images and Hebrew words that may have belonged to a biblical governor of Jerusalem. 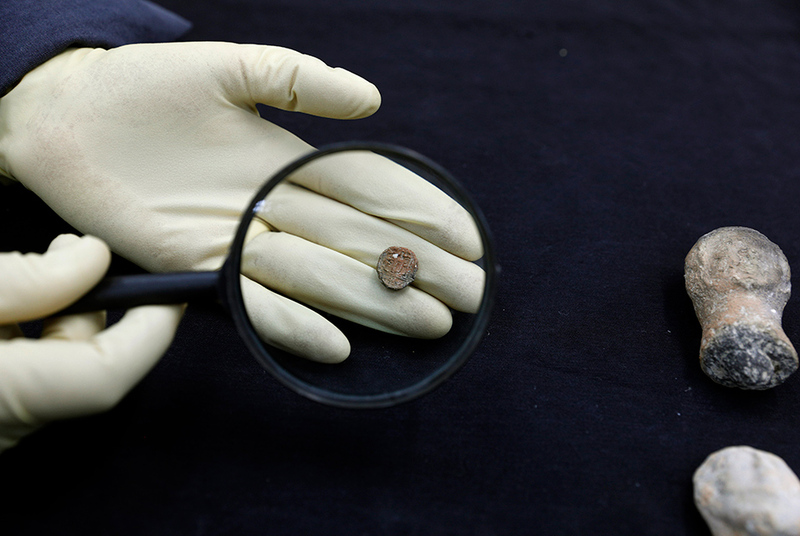 The round button-sized seal was found in a building in Jerusalem's Old City near the Western Wall and dates back to the 7th century BC, from the time of the First Jewish Temple, said the Israel Antiquities Authority. The artefact bears an engraving showing two men wearing robes and facing each other in a mirror-like manner. Below them is an inscription in ancient Hebrew that reads "to the governor of the city", or mayor. "It's a very rare find," said Shlomit Weksler-Bdolah, excavator of the Western Wall plaza for the Israel Antiquities Authority. "The find's great importance is that until now, we only know the expression of city governor (of Jerusalem) from the Bible," she told AFP. "This is the first time we find it in the archaeological context, in an archaeological dig of a structure from the seventh century BC," she added. The seal does not mention the name of the governor or the city of Jerusalem, but Weksler-Bdolah said she believed it referred to the Holy City. She said a scientific examination of the seal would be conducted soon and was expected to corroborate its link to Jerusalem. According to her, the seal was apparently attached to an object to be delivered to someone on behalf of the governor of the city. News of the discovery comes as tensions swirl around Jerusalem after US President Donald Trump designated the city as Israel's capital. Boca Raton Museum of Art exhibits "Regarding George Ohr: Contemporary Ceramics in the Spirit of the Mad Potter"